This article is about the price of crude oil. For information about derivative motor fuels, see gasoline and diesel usage and pricing. For detailed history of price movements since 2003, see World oil market chronology from 2003. Oil prices in USD, 1861–2015 (1861–1944 averaged US crude oil, 1945–1983 Arabian Light, 1984–2015 Brent). Red line adjusted for inflation, blue not adjusted. The price of oil, or the oil price, (generally) refers to the spot price of a barrel of benchmark crude oil—a reference price for buyers and sellers of crude oil such as West Texas Intermediate (WTI), Brent ICE, Dubai Crude, OPEC Reference Basket, Tapis Crude, Bonny Light, Urals oil, Isthmus and Western Canadian Select (WCS). There is a differential in the price of a barrel of oil based on its grade—determined by factors such as its specific gravity or API and its sulphur content—and its location—for example, its proximity to tidewater and/or refineries. Heavier, sour crude oils lacking in tidewater access—such as Western Canadian Select—are less expensive than lighter, sweeter oil—such as WTI. In 1960 the Organization of the Petroleum Exporting Countries (OPEC) was founded in Baghdad, Iraq by its first five members —Iran, Iraq, Kuwait, Saudi Arabia and Venezuela—, with Qatar and Libya joining immediately, followed by United Arab Emirates, Algeria, Nigeria, Ecuador and Gabon after a decade. The goal of these countries was to increase its influence in the world oil market, then dominated by a cartel known as the "Seven Sisters", five of which were headquartered in the United States. These companies had been controlling posted prices since the so-called 1927 Red Line Agreement and 1928 Achnacarry Agreement, and had achieved a high level of price stability until 1972. Angola joined the OPEC in 2007 and Equatorial Guinea in 2017. According to a report released on February 15, 2016 by Deloitte LLP—the audit and consulting firm—with global crude oil at near ten-year low prices, 35% of listed E&P oil and gas companies are at a high risk of bankruptcy worldwide. Indeed, bankruptcies "in the oil and gas industry could surpass levels seen in the Great Recession." There are two views dominating the oil market discourse. There are those who strongly believe that the market has undergone structural changes and that low oil prices are here to stay for a prolonged period. At the other end of the spectrum, there are those who think that this is yet another cycle and oil prices will recover sooner rather than later. A 2016 survey of the academic literature finds that "most major oil price fluctuations dating back to 1973 are largely explained by shifts in the demand for crude oil". As the global economy expands, so does demand for crude oil. The authors note that the price of oil has also increased at times due to greater "demand for stocks (or inventories) of crude oil... to guard against future shortages in the oil market. Historically, inventory demand has been high in times of geopolitical tension in the Middle East, low spare capacity in oil production, and strong expected global economic growth." In particular, political events can have a strong influence on the oil price. Historical examples include OPEC’s 1973 embargo in reaction to the Yom Kippur War and the 1979 Iranian Revolution. Financial analysts and academics have had very few tools to study such political events compared to what is available on economic aspects of oil price formation. The PRIX index was developed in attempt to fill this gap with a metric on political developments and corresponding export trends from world’s 20 largest oil exporters. The supply of oil is dependent on geological discovery, the legal and tax framework for oil extraction, the cost of extraction, the availability and cost of technology for extraction, and the political situation in oil-producing countries. Both domestic political instability in oil producing countries and conflicts with other countries can destabilise the oil price. In 2008 the New York Times reported, for example, in the 1940s the price of oil was about $17 rising to just over $20 during the Korean War (1951–1953). During the Vietnam War (1950s – 1970s) the price of oil slowly declined to under $20. During the Arab oil embargo of 1973—the first oil shock—the price of oil rapidly rose to double in price. During the 1979 Iranian Revolution the price of oil rose. During the second oil shock the price of oil peaked in April 1980 at $103.76. During the 1980s there was a period of "conservation and insulation efforts" and the price of oil dropped slowly to c. $22. It again reached a peak of c. $65 during the 1990 Persian Gulf crisis and war. Following that, there was a period of global recessions and the price of oil hit a low of c. $15 before it peaked at a high of $45 on September 11, 2001 only to drop again to a low of $26 on May 8, 2003. The price rose to $80 with the U.S.-led invasion of Iraq. By March 3, 2008 the price of oil reached $103.95 a barrel on the New York Mercantile Exchange. Although the oil price is largely determined by the balance between supply and demand—as with all commodities—some commentators including Business Week, the Financial Times and the Washington Post, argued that the rise in oil prices prior to the financial crisis of 2007–2008 was due to speculation in futures markets. For a dissenting view of oil prices being determined by demand, see Forbes, "Global Oil Demand is Always Rising – and Not Related to Price". In North America this generally refers to the WTI Cushing Crude Oil Spot Price West Texas Intermediate (WTI), also known as Texas Light Sweet, a type of crude oil used as a benchmark in oil pricing and the underlying commodity of New York Mercantile Exchange's oil futures contracts. WTI is a light crude oil, lighter than Brent Crude oil. It contains about 0.24% sulfur, rating it a sweet crude, sweeter than Brent. Its properties and production site make it ideal for being refined in the United States, mostly in the Midwest and Gulf Coast regions. WTI has an API gravity of around 39.6 (specific gravity approx. 0.827) per barrel (159 liters) of either WTI/light crude as traded on the New York Mercantile Exchange (NYMEX) for delivery at Cushing, Oklahoma. Cushing, Oklahoma, a major oil supply hub connecting oil suppliers to the Gulf Coast, has become the most significant trading hub for crude oil in North America. In Europe and some other parts of the world, the oil price benchmark is Brent as traded on the Intercontinental Exchange (ICE, into which the International Petroleum Exchange has been incorporated) for delivery at Sullom Voe. Other important benchmarks include Dubai, Tapis, and the OPEC basket. The Energy Information Administration (EIA) uses the imported refiner acquisition cost, the weighted average cost of all oil imported into the US, as its "world oil price". In Robert Mabro's 2006 book on challenges and opportunities in oil in the 21st century, after the collapse of the OPEC-administered pricing system in 1985, and a short lived experiment with netback pricing, oil-exporting countries adopted a market-linked pricing mechanism. First adopted by PEMEX in 1986, market-linked pricing received wide acceptance and by 1988 became and still is the main method for pricing crude oil in international trade. The current reference, or pricing markers, are Brent, WTI, and Dubai/Oman. In June 2008 Business Week reported that the surge in oil prices prior to 2008 had led some commentators to argue that at least some of the rise was due to speculation in the futures markets. However, although speculation can greatly raise the oil price in the short run, in the long run fundamental market conditions will determine the oil price. Storing oil is expensive, and all speculators must ultimately, and generally within a few months, sell the oil they purchase. According to a U.S. Commodity Futures Trading Commission (CFTC) May 29, 2008 report the "Multiple Energy Market Initiatives" was launched in partnership with the United Kingdom Financial Services Authority and ICE Futures Europe in order to expand surveillance and information sharing of various futures contracts. Part 1 is "Expanded International Surveillance Information for Crude Oil Trading." This announcement has received wide coverage in the financial press, with speculation about oil futures price manipulation. The interim report by the Interagency Task Force, released in July, found that speculation had not caused significant changes in oil prices and that fundamental supply and demand factors provide the best explanation for the crude oil price increases. The report found that the primary reason for the price increases was that the world economy had expanded at its fastest pace in decades, resulting in substantial increases in the demand for oil, while the oil production grew sluggishly, compounded by production shortfalls in oil-exporting countries. The report stated that as a result of the imbalance and low price elasticity, very large price increases occurred as the market attempted to balance scarce supply against growing demand, particularly in the last three years. The report forecast that this imbalance would persist in the future, leading to continued upward pressure on oil prices, and that large or rapid movements in oil prices are likely to occur even in the absence of activity by speculators. The task force continues to analyze commodity markets and intends to issue further findings later in the year. The strategy works because oil prices for delivery in the future are trading at a premium to those in the spot market – a market structure known in the industry as contango – with investors expecting prices to eventually recover from the near 60 percent slide in oil in the last seven months. The oil-storage trade, also referred to as contango, a market strategy in which large, often vertically-integrated oil companies purchase oil for immediate delivery and storage—when the price of oil is low— and hold it in storage until the price of oil increases. Investors bet on the future of oil prices through a financial instrument, oil futures in which they agree on a contract basis, to buy or sell oil at a set date in the future. Crude oil is stored in salt mines, tanks and oil tankers. Investors can choose to take profits or losses prior to the oil-delivery date arrives. Or they can leave the contract in place and physical oil is "delivered on the set date" to an "officially designated delivery point", in the United States, that is usually Cushing, Oklahoma. When delivery dates approach, they close out existing contracts and sell new ones for future delivery of the same oil. The oil never moves out of storage. If the forward market is in "contango"—the forward price is higher than the current spot price—the strategy is very successful. Scandinavian Tank Storage AB and its founder Lars Jacobsson introduced the concept on the market in early 1990. But it was in 2007 through 2009 the oil storage trade expanded, with many participants—including Wall Street giants, such as Morgan Stanley, Goldman Sachs, and Citicorp—turning sizeable profits simply by sitting on tanks of oil. By May, 2007 Cushing's inventory fell by nearly 35% as the oil-storage trade heated up. The trend follows a spike in oil futures prices that has created incentives for traders to buy crude oil and oil products at current rates, sell them on futures markets and store them until delivery. By the end of October 2009 one in twelve of the largest oil tankers was being used more for temporary storage of oil, rather than transportation. From June 2014 to January 2015, as the price of oil dropped 60 percent and the supply of oil remained high, the world's largest traders in crude oil purchased at least 25 million barrels to store in supertankers to make a profit in the future when prices rise. Trafigura, Vitol, Gunvor, Koch, Shell and other major energy companies began to book booking oil storage supertankers for up to 12 months. 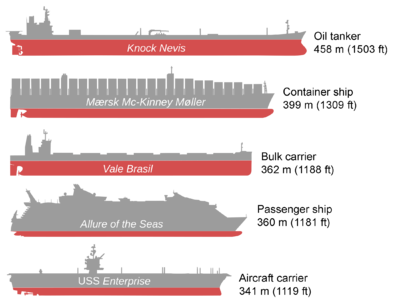 By 13 January 2015 At least 11 Very Large Crude Carriers (VLCC) and Ultra Large Crude Carriers (ULCC)" have been reported as booked with storage options, rising from around five vessels at the end of last week. Each VLCC can hold 2 million barrels." In 2015 as global capacity for oil storage was out-paced by global oil production, and an oil glut occurred. Crude oil storage space became a tradable commodity with CME Group— which owns NYMEX— offering oil-storage futures contracts in March 2015. Traders and producers can buy and sell the right to store certain types of oil. By 5 March 2015, as oil production outpaces oil demand by 1.5 million barrels a day, storage capacity globally is dwindling. In the United States alone, according to data from the Energy Information Administration, U.S. crude-oil supplies are at almost 70% of the U. S. storage capacity, the highest to capacity ratio since 1935. Peak oil is the period when the maximum rate of global petroleum extraction is reached, after which the rate of production enters terminal decline. It relates to a long-term decline in the available supply of petroleum. This, combined with increasing demand, will significantly increase the worldwide prices of petroleum derived products. Most significant will be the availability and price of liquid fuel for transportation. The US Department of Energy in the Hirsch report indicates that "The problems associated with world oil production peaking will not be temporary, and past "energy crisis" experience will provide relatively little guidance." According to the United Nations, world oil demand is projected to reach over 99 million barrels per day in 2018. A major rise or decline in oil price can have both economic and political impacts. The decline on oil price during 1985–1986 is considered to have contributed to the fall of the Soviet Union. Low oil prices could alleviate some of the negative effects associated with the resource curse, such as authoritarian rule and gender inequality. Lower oil prices could however also lead to domestic turmoil and diversionary war. The reduction in food prices that follows lower oil prices could have positive impacts on violence globally. Research shows that declining oil prices make oil-rich states less bellicose. Low oil prices could also make oil-rich states engage more in international cooperation, as they become more dependent on foreign investments. The influence of the United States reportedly increases as oil prices decline, at least judging by the fact that "both oil importers and exporters vote more often with the United States in the United Nations General Assembly" during oil slumps. The macroeconomics impact on lower oil prices is lower inflation. A lower inflation rate is good for the consumers. This means that the general price of a basket of goods would increase at a bare minimum on a year to year basis. Consumer can benefit as they would have a better purchasing power, which may improve real gdp. However, in recent countries like Japan, the decrease in oil prices may cause deflation and it shows that consumers are not willing to spend even though the prices of goods are decreasing yearly, which indirectly increases the real debt burden. Declining oil prices may boost consumer oriented stocks but may hurt oil-based stocks. It is estimated that 17–18% of S&P would decline with declining oil prices. The oil importing economies like EU, Japan, China or India would benefit, however the oil producing countries would lose. A Bloomberg article presents results of an analysis by Oxford Economics on the GDP growth of countries as a result of a drop from $84 to $40. It shows the GDP increase between 0.5% to 1.0% for India, USA and China, and a decline of greater than 3.5% from Saudi Arabia and Russia. A stable price of $60 would add 0.5 percentage point to global gross domestic product. Katina Stefanova has argued that falling oil prices do not imply a recession and a decline in stock prices. Liz Ann Sonders, Chief Investment Strategist at Charles Schwab, had earlier written that that positive impact on consumers and businesses outside of the energy sector, which is a larger portion of the US economy will outweigh the negatives. Taking cues from a legendary oil investor, Harold Hamm, ranked as one of the richest men in the world by Forbes, Shawn Baldwin, Chairman of alternative investment firm The AIA Group, speculates that oil prices will rise by year-end 2016 from current levels. Economists have observed that the 2010s oil glut started with a considerable time-lag, more than six years after the beginning of the Great Recession: "the price of oil [had] stabilized at a relatively high level (around $100 a barrel) unlike all previous recessionary cycles since 1980 (start of First Persian Gulf War). But nothing guarantee[d] such price levels in perpetuity". During 2014–2015, OPEC members consistently exceeded their production ceiling, and China experienced a marked slowdown in economic growth. At the same time, U.S. oil production nearly doubled from 2008 levels, due to substantial improvements in shale "fracking" technology in response to record oil prices. A combination of factors led a plunge in U.S. oil import requirements and a record high volume of worldwide oil inventories in storage, and a collapse in oil prices that continues into 2016. The North Sea oil and gas industry was financially stressed by the reduced oil prices, and called for government support in May 2016. The use of hedging using commodity derivatives as a risk management tool on price exposure to liquidity and earnings, has been long established in North America. Chief Financial Officers (CFOS) use derivatives to dampen, remove or mitigate price uncertainty. Bankers also use hedge funds to more "safely increase leverage to smaller oil and gas companies." However, when not properly used, "derivatives can multiply losses" particularly in North America where investors are more comfortable with higher levels of risk than in other countries. With the large number of bankruptcies as reported by Deloitte "funding [for upstream oil industry] is shrinking and hedges are unwinding." "Some oil producers are also choosing to liquidate hedges for a quick infusion of cash, a risky bet." Access to capital markets, bankers' support and derivatives protection, which helped smooth an otherwise rocky road, are fast waning...The roughly 175 companies at risk of bankruptcy have more than $150 billion in debt, with the slipping value of secondary stock offerings and asset sales further hindering their ability to generate cash. To finance exploration and production of the unconventional oil industry in the United States, "hundreds of billions of dollars of capital came from non-bank participants [non-bank buyers of bank energy credits] in leveraged loans] that were thought at the time to be low risk. However, with the oil glut that continued into 2016, about a third of oil companies are facing bankruptcy. While investors were aware that there was a risk that the operator might declare bankruptcy, they felt protected because "they had come in at the 'bank' level, where there was a senior claim on the assets [and] they could get their capital returned." ... in recent years the combination of the development of large resource plays in the US and the emergence of business models designed to ensure consistent dividend payouts to investors has led to the development of more aggressive hedging policies in companies and less restrictive covenants in bank loans. A classic example of taking on too much risk through hedging is the 1982 collapse of Penn Square Bank caused by plummeting of the price of oil in 1981. Penn Square Bank had lent too much to Exploration and Production E&P operators. Penn Square Bank caused the failure of Seafirst in 1982 and then Continental Illinois. When they failed and were liquidated by the Federal Deposit Insurance Corporation (FDIC) the non-bank buyers or participants of bank energy credits of these leveraged loans participants were considered to be 'unsecured claims,' not 'true sales' and they were not able to collect any capital. At the 5th annual World Pensions Forum in 2015, Jeffrey Sachs advised institutional investors to divest from carbon-reliant oil industry firms in their pension fund's portfolio. Because of oversupply and lack of agreements between oil-producing countries members of the OPEC (Saudi Arabia in particular, which pumped at world's records) and also because of lack of coordinated efforts between OPEC and Non-OPEC countries (Russian being a big player, refusing to reduce production) the price of oil fell rapidly in 2015 and continued to slide in 2016 causing the cost of WTI crude to fall to a 10-year low of $26.55 on January 20. The average price of oil in January 2016 was well below $35. Oil did not recover until April 2016, when oil went above the $45 mark. By 20 January 2016, the OPEC Reference Basket was down to US$22.48/bbl—less than one-fourth of its high from June 2014 ($110.48), less than one-sixth of its record from July 2008 ($147.27), and back below the April 2003 starting point ($23.27) of its historic run-up. According to the United Nations, growth prospects of the oil exporters are predicted to remain subdued past 2018. In late September and early October 2018, the price of oil rose to a 4-year high of over $80 for the benchmark Brent crude in response to concerns about constraints on global supply. The production capacity in Venezuela had decreased. United States sanctions against Iran, OPEC's third-biggest oil producer, were set to be restored and tightened in November. In June OPEC reduced production. According to MarketWatch, in October the price of oil began to drop as the Trump administration made exceptions to their sanctions against Iran for China, India, Greece, Italy, Taiwan, Japan, Turkey and South Korea allowing them to import Iranian oil. The November 1, 2018 U.S. Energy Information Administration (EIA) report announced that the US had become the "leading crude oil producer in the world" when it hit a production level of 11.3 barrel a day in August 2018, mainly because of its shale oil production. By the end of November the price of Brent had dropped rapidly to $58.71, more than 30% from its peak, the biggest 30-day drop since 2008. Increased oil production in Russia, some OPEC countries and the United States, which deepened global over supply, were factors in the crash. President Trump said that the lower price of oil was like a "big Tax Cut for America and the World". An article in The Economist said that rising oil prices have a negative impact on oil-importing countries in terms of international trade. Import prices rise in relation to their exports. The importing country’s current account deficits widen because "their exports pay for fewer imports". As of January 10, 2019, the price of the OPEC Reference Basket (ORB) of 14 crudes was $59.48 a barrel. ^ "Pricing Differences Among Various Types of Crude Oil". EIA. Retrieved February 17, 2008. ^ "Our Mission". OPEC. Retrieved February 16, 2013. ^ a b c Yergin, Daniel (1991). The Prize: The Epic Quest for Oil, Money, and Power. New York: Simon & Schuster. pp. 499–503. ISBN 978-0671502485. ^ Painter, David S. (2012). "Oil and the American Century" (PDF). The Journal of American History. 99 (1): 32. doi:10.1093/jahist/jas073. ^ Mouawad, Jad (November 9, 2007). "Rising Demand for Oil Provokes New Energy Crisis". Retrieved March 25, 2018 – via NYTimes.com. ^ "Cushing, OK WTI Spot Price FOB (Dollars per Barrel)". tonto.eia.doe.gov. Retrieved March 25, 2018. ^ "US oil settles at $37.51 a barrel after hitting 2009 lows". CNCB via Reuters. December 8, 2015. Retrieved February 17, 2016. ^ "BBC News – Egypt unrest pushes Brent crude oil to $100 a barrel". BBC News. January 31, 2011. Retrieved January 5, 2015. ^ Nicole Friedman (December 31, 2014). "U.S. Oil Falls 46%, Steepest Yearly Loss Since 2008 – WSJ". WSJ. Retrieved January 5, 2015. ^ Evans-Pritchard, Ambrose (December 29, 2015). "Goldman eyes $20 oil as glut overwhelms storage sites". The Telegraph. Retrieved December 29, 2015. ^ a b "Oil futures bounce on OPEC deal speculation". CNCB via Reuters. February 16, 2016. Retrieved February 17, 2016. ^ DiChristopher, Tom (January 4, 2016). "Oil may fall to $18 amid Gulf tensions: Kilduff". cnbc.com. Retrieved March 25, 2018. ^ a b Scheyder, Ernest (February 16, 2016). "High risk of bankruptcy for one-third of oil firms: Deloitte". Houston: Reuters. Retrieved February 17, 2016. ^ a b c Zillman, Claire (February 16, 2016). "One-Third of Oil Companies Could Go Bankrupt this Year". Fortune. Retrieved February 17, 2016. ^ Fattouh, Bassam (2016). "Adjustment in the Oil Market : Structural, Cyclical or Both?". Oxford Energy Comment. Oxford Institute for Energy Studies. ^ a b c Baumeister, Christiane; Kilian, Lutz (January 1, 2016). "Forty Years of Oil Price Fluctuations: Why the Price of Oil May Still Surprise Us". The Journal of Economic Perspectives. 30 (1): 139–160. doi:10.1257/jep.30.1.139. ^ a b "PRIX index forecasts ample oil supplies". Commodities Now. June 30, 2016. ^ "Quantifying Political Risk". Oil&Gas Financial Journal. August 7, 2015. Retrieved September 26, 2015. ^ a b Ed Wallace (June 27, 2008). "Oil Prices Are All Speculation". Business Week. ^ a b "CFTC in talks to plug the 'London loophole'". The Financial Times. June 10, 2008. Retrieved June 11, 2008. ^ a b Mufson, Steven (May 30, 2008). "Probe of Crude Oil Trading Disclosed". Washington Post. Retrieved June 11, 2008. ^ a b "Government investigates oil markets". CNN Money. May 30, 2008. Archived from the original on June 1, 2008. Retrieved June 11, 2008. ^ a b "CFTC Announces Multiple Energy Market Initiatives". CFTC. Release: 5503-08. May 29, 2008. Archived from the original on June 1, 2008. Retrieved June 11, 2008. ^ a b c Mabro, Robert (2006). Oil in the 21st century: issues, challenges and opportunities. Organization of Petroleum Exporting Countries. Oxford Press. p. 351. ISBN 9780199207381. ^ "Bloomberg Energy Prices". Bloomberg.com. Retrieved June 11, 2008. ^ Norris, Michele (December 17, 2008). "Contango In Oil Markets Explained". ^ a b Davis, Anne (October 6, 2007). "Where Has All The Oil Gone? After Sitting on Crude, speculators Unload It. The World's Eyes Fall on Cushing, Oklahoma". Wall Street Journal. ^ Wright, Robert (November 17, 2009). "Tankers store oil as futures prices rocket". Financial Times. London, UK. ^ "Oil traders to store millions of barrels at sea as prices slump". Reuters. January 13, 2015. Retrieved January 20, 2015. ^ "Barrel Breakdown". Wall Street Journal. April 15, 2016. ^ "DOE Hirsch Report" (PDF). doe.gov. Retrieved March 25, 2018. ^ "World Economic Situation and Prospects 2018". United Nations Department of Economic and Social Affairs, Development Policy and Analysis Division. Table A.12. ISBN 978-92-1-109177-9. Retrieved March 2, 2018. ^ "The Soviet Collapse: Grain and Oil, By Yegor Gaidar, American Enterprise Institute, 2007" (PDF). Retrieved October 17, 2015. ^ Wright, Joseph; Frantz, Erica; Geddes, Barbara (April 1, 2015). "Oil and Autocratic Regime Survival". British Journal of Political Science. 45 (02): 287–306. doi:10.1017/S0007123413000252. ISSN 1469-2112. ^ Jensen, Nathan; Wantchekon, Leonard (September 1, 2004). "Resource Wealth and Political Regimes in Africa". Comparative Political Studies. 37 (7): 816–841. doi:10.1177/0010414004266867. ISSN 0010-4140. ^ Ross, Michael L. (April 1, 2001). "Does Oil Hinder Democracy?". World Politics. 53 (03): 325–361. doi:10.1353/wp.2001.0011. ISSN 1086-3338. ^ Ulfelder, Jay (August 1, 2007). "Natural-Resource Wealth and the Survival of Autocracy". Comparative Political Studies. 40 (8): 995–1018. doi:10.1177/0010414006287238. ISSN 0010-4140. ^ Basedau, Matthias; Lay, Jann (November 1, 2009). "Resource Curse or Rentier Peace? The Ambiguous Effects of Oil Wealth and Oil Dependence on Violent Conflict". Journal of Peace Research. 46 (6): 757–776. doi:10.1177/0022343309340500. ISSN 0022-3433. ^ "--". doi:10.1177/0010414015597510. Retrieved November 7, 2015. ^ Ross, Michael L. (February 1, 2008). "Oil, Islam, and Women". American Political Science Review. 102 (01): 107–123. doi:10.1017/S0003055408080040. ISSN 1537-5943. ^ a b Voeten, Erik (January 28, 2016). "Here's how falling oil prices could make the world more peaceful and cooperative". The Washington Post. ISSN 0190-8286. Retrieved January 28, 2016. ^ Hendrix, Cullen S. (October 19, 2015). "Oil prices and interstate conflict". Conflict Management and Peace Science: 0738894215606067. doi:10.1177/0738894215606067. ISSN 0738-8942. ^ Ross, Michael L.; Voeten, Erik (December 14, 2015). "Oil and International Cooperation". International Studies Quarterly: sqv003. doi:10.1093/isq/sqv003. ISSN 0020-8833. ^ a b Pettinger, Tevjan. "Impact of falling oil prices". Economics Org. Retrieved October 5, 2017. ^ Rosenberg, Alex (October 5, 2014). "What the impact of plunging oil prices really means". cnbc.com. Retrieved March 25, 2018. ^ "Goldman Consumer Stocks To Benefit From Low Oil Prices – Business Insider". Business Insider. November 17, 2014. Retrieved October 17, 2015. ^ "The Effect of Low Oil Prices: A Regional Tour – The Financialist". The Financialist. Archived from the original on October 17, 2015. Retrieved October 17, 2015. ^ Eric Yep (January 4, 2015). "Falling Oil Spells Boon for Most of Asia's Economies". WSJ. Retrieved October 17, 2015. ^ "Who Profits When Oil Prices Plunge?". PrimePair. January 13, 2015. Archived from the original on January 13, 2015. Retrieved October 17, 2015. ^ Katina Stefanova. "Do Falling Oil Prices Foreshadow a Slump in the Stock Market in 2015?". Forbes. Retrieved October 17, 2015. ^ "Black Dog: Are Plunging Oil Prices a Positive or a Negative?, Liz Ann Sonders, November 3, 2014". schwab.com. Archived from the original on December 20, 2014. Retrieved March 25, 2018. ^ "Shawn Baldwin Discusses Why Oil Will Hit $60–$65 with Harold Hamm". Fast Company. Retrieved January 13, 2016. ^ Firzli, M. Nicolas J. (April 6, 2014). "A GCC House Divided: Country Risk Implications of the Saudi-Qatari Rift". Al-Hayat. London. Retrieved December 29, 2014. ^ Krassnov, Clifford (November 3, 2014). "U.S. Oil Prices Fall Below $80 a Barrel". The New York Times. Retrieved December 13, 2014. ^ "OPEC Won't Cut Production to Stop Oil's Slump". Bloomberg News. December 4, 2015. ^ a b "OPEC Basket Daily Archives". OPEC. Retrieved January 21, 2016. ^ Gould, Edward Pearce (January 28, 2016). "Opportunity From The Decline In Oil Price". seekingalpha.com. Retrieved March 25, 2018. ^ Mark Lammey. "North Sea industry heading for Lehman Brothers magnitude crash" 27 May 2016. ^ a b c d e f Price, Kevin (November 1, 2012). "Hedging Is An Effective Risk Management Tool For Upstream Companies". London: Oil and Gas Financial Journal. Retrieved February 17, 2016. ^ a b c d Dizard, John (January 9, 2015). "Lesson from history on perils facing oil and gas investors". Financial Times. Retrieved February 17, 2016. ^ Pearce, Andrew (December 6, 2015). "Jeffrey Sachs: Fund Managers Have a Duty to Dump Fossil Fuels". Financial News. Retrieved December 30, 2015. ^ "World Economic Situation and Prospects 2018". United Nations Department of Economic and Social Affairs, Development Policy and Analysis Division. p. 4. ISBN 978-92-1-109177-9. Retrieved March 2, 2018. ^ a b Vaughan, Adam (November 12, 2018). "Oil prices rise as Saudi Arabia signals production cut". The Guardian. ISSN 0261-3077. Retrieved January 12, 2019. ^ a b c d "Rising oil prices catch emerging economies at a vulnerable moment". The Economist. September 29, 2018. ISSN 0013-0613. Retrieved January 12, 2019. ^ "US re-imposes Iran sanctions, but waivers eight countries for oil imports". France 24. November 5, 2018. Retrieved January 12, 2019. ^ Saefong, Myra P.; Beals, Rachel Koning (November 16, 2018). "Oil prices suffer sixth weekly loss in a row". Market Watch. "Rising petro-nations’ oil production, the U.S. shale oil boom, swelling North American oil inventories and, not least, too high oil prices curbing emerging market oil demand growth were the factors which calmed the bullish market mood” in October, pulling the price of Brent from above $85 a barrel to below $75," said Norbert Ruecker, head of macro and commodity research at Julius Baer, in a note. ^ "U.S. monthly crude oil production exceeds 11 million barrels per day in August". U.S. Energy Information Administration (EIA). Today in Energy. November 1, 2018. Retrieved January 12, 2019. ^ a b Saefong, Myra P.; Beals, Rachel Koning (November 30, 2018). "Oil prices drop 22% in November for biggest monthly loss in a decade". Market Watch. Retrieved January 12, 2019. ^ a b Egan, Matt (November 21, 2018). "The Great Oil Crash of 2018: What's really going on". CNN. Business. Retrieved January 12, 2019. ^ "OPEC daily basket price stood at $59.48 a barrel". OPEC :. Vienna, Austria. January 10, 2019. Retrieved January 12, 2019. The OPEC Reference Basket of Crudes (ORB) is made up of the following: Saharan Blend (Algeria), Girassol (Angola), Djeno (Congo), Oriente (Ecuador), Zafiro (Equatorial Guinea), Rabi Light (Gabon), Iran Heavy (Islamic Republic of Iran), Basra Light (Iraq), Kuwait Export (Kuwait), Es Sider (Libya), Bonny Light (Nigeria), Arab Light (Saudi Arabia), Murban (UAE) and Merey (Venezuela). Wikimedia Commons has media related to Oil prices. Gasoline and diesel fuel prices, EIA, Department of Energy. Skyrocketing oil prices pummel U.S. national security. CME (formerly NYMEX) future prices for light sweet crude, Session Overview. History and Analysis of Crude Oil Prices. Energy Futures Databrowser Current and historical charts of NYMEX energy futures chains. This page was last edited on 21 March 2019, at 21:25 (UTC).